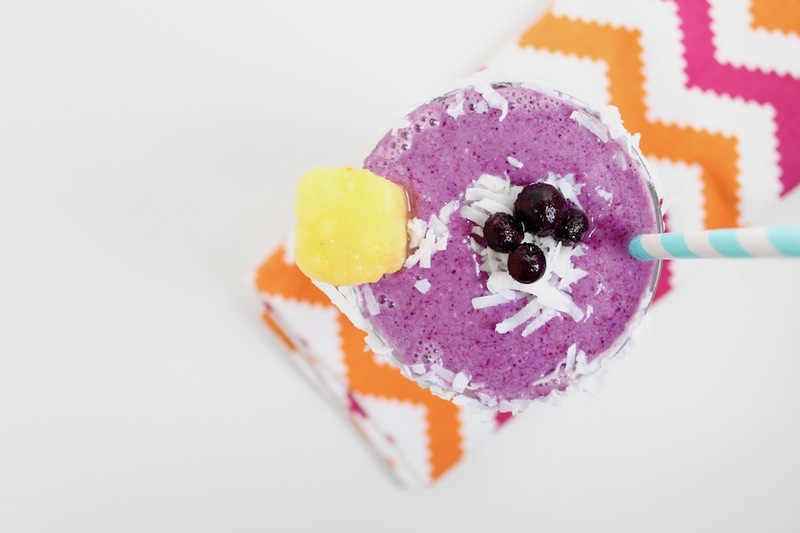 Wild Blueberry Pina Colada Smoothie Recipe — A healthy start to your day with a tropical twist! 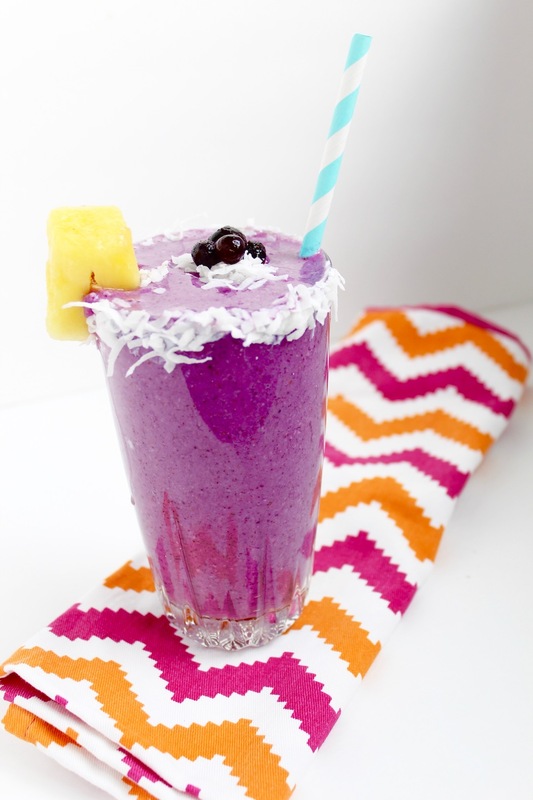 Made with wild blueberries, frozen pineapple, and coconut water, it’s a taste of the tropics in a glass! T to the G to the I to the all mighty F. Who’s with me?! I may be ignoring the fact that mother nature just unloaded her fury in the form of 13 inches of snow with this one, but I like to keep this blog a positive space. Let’s think kind thoughts of sun, sand, and drink in hand. It’s days like these that you need to just ride out the storm, pull the shades down, crank the heat, put umbrellas in your drinks, and remind yourself that summer is one day closer. I mean, you can’t really beat summers in Maine. Our license plates say VACATIONLAND. C’mon people. PLUS we’re the home to the double delicious, double antioxidant, double AWESOME wild blueberries (Ow! Ow! ), so really we should be called Blueberryville Vacationland. Truth: I don’t think I’ve actually had a pina colada in my adult life. Sure, I slugged a few umbrella-ed drinks in my youth when I wasn’t slamming back double shirley temples left and right. …and by double, I mean double cherry. Duh. What tops your vacation wish list? 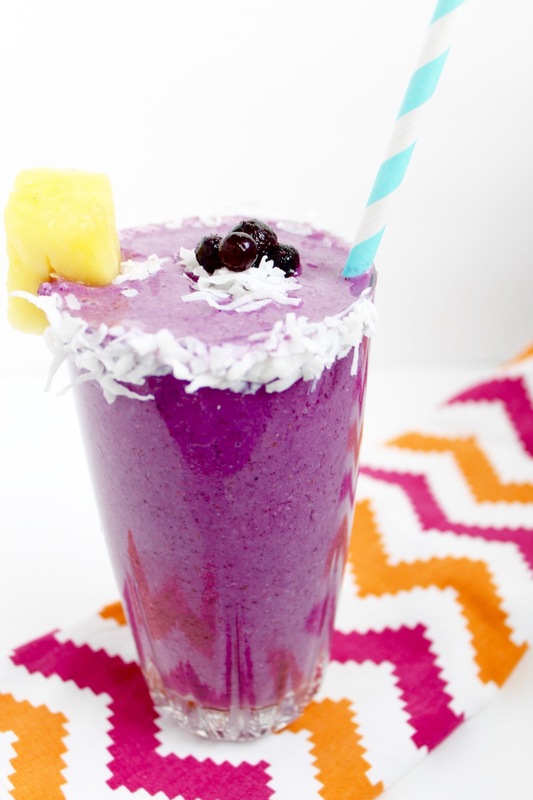 I love everything about this smoothie…The color…The ingredients..And those coconut flakes around the rim…DELICIOUS! Look at those beautiful colours! I can’t wait to make that this weekend!!!! THANKS! The only thing that would make this recipe better is if I could actually enjoy it while laying on the beach. May need to make it and use my imagination a bit for the time being! I make an pina cola protein smoothie but never thought to put blueberries in! So beautiful and sounds delicious! Yum!! who needs to get away to a tropical island when you have a smoothie as beautiful and tasty as this!? The color is eye catching! Makes me think of spring. Good luck with the contest. Pina colada flavors plus blueberries? Sign me up now! This looks delicious. Also, I LOVE that napkin/fabric you chose to go with it in the photos – so fun and upbeat! can i add a little vodka and make it appropriate for Friday night? 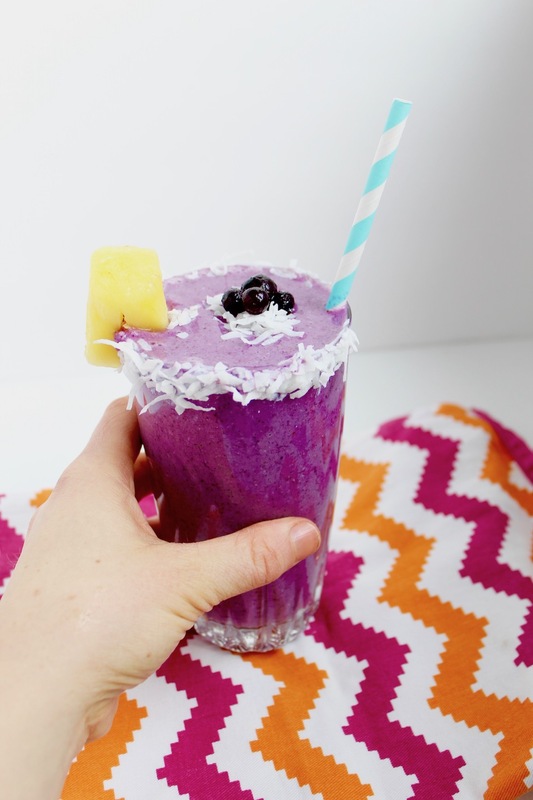 I used to love to make raspberry Piña coladas, so I’m sure I will enjoy a blueberry one! 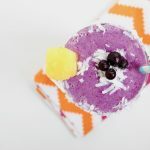 My daughter is always looking for new smoothie recipes and these blueberry ones all sound delicious. We’ll have to try a few of them out. Good luck with the contest! Thanks so much Karen! Let me know if you give any a try!